Tye Dye Everything is a colorful little shop located downtown at 527 South Main Street behind Mikey's Gyros and the Moscow Pawn Shop. 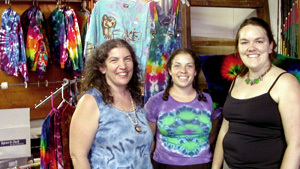 We have expressed the joy of color by producing vibrant tye-dyed clothing and accessories since 1989. We offer more than 150 different tye-dyed items, including t-shirts, tanktops, sweats, dresses, pants, hats, baby clothes, sheets, underwear, lab coats, scrubs, wall hangings and more. Half the shop is our production facility and the other half holds our retail inventory which includes all our tye-dyed clothing, plus stickers, incense, pouches and other accessories. Custom orders are gratefully accepted and bulk discounts are available. Our website,www.tyedye-everything.com includes our 150+ items and our show schedule -- we travel throughout the Northwest from March until November visiting arts and crafts shows with our handmade wares.